The problem with this bar is that I generally find myself moving it around in order to scale the keys in the Curve Editor. “What’s wrong with that?”, you may ask. Good question! Every time the Scale Values tool is selected, 3dsMax saves its previous position, so if I was editing some keys at -100, and now I want to edit some other keys at +300, I have to go all the way down to go fetch the damn bar. Sure, I can close the Curve Editor and reopen it so that the bar position is reset to its default (value = 0), but I still have to move it from 0 to 300 (or whatever the value is). All this process annoys me. To run the script, just go to the Maxscript menu and select “Run Script”. Then select the script and click OK.
Now, let’s put the script in a quad, shall we? 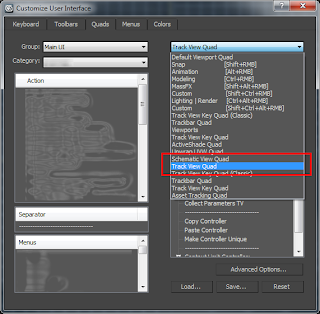 In the Customize menu, select “Customize User Interface” to edit your Quad for the Curve Editor. Select the “AnimTool” category. The script name is… Well, the only script in the category… “Edit Scale Bar”. 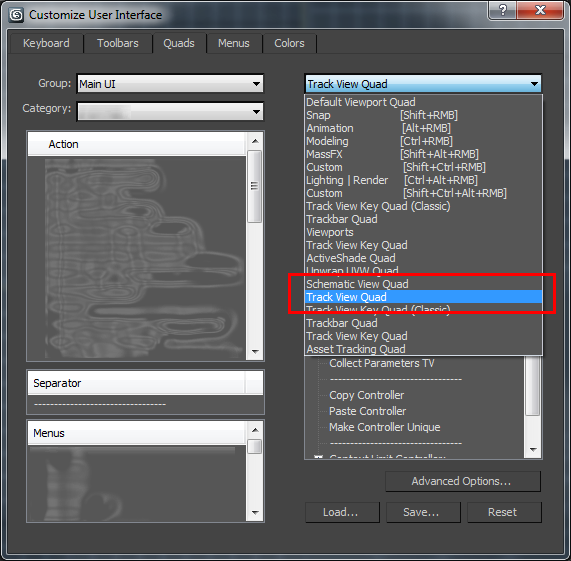 Drag and drop it into the Track View Quad (see image below). You can put it into any of the four available quads, no worries. 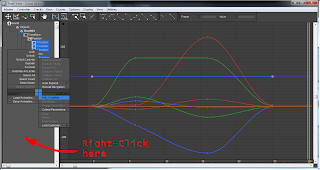 In the Curve Editor, select the Scale Values tool (Keys menu). Right-click in the hierarchy panel, NOT WHERE THE KEYS ARE. 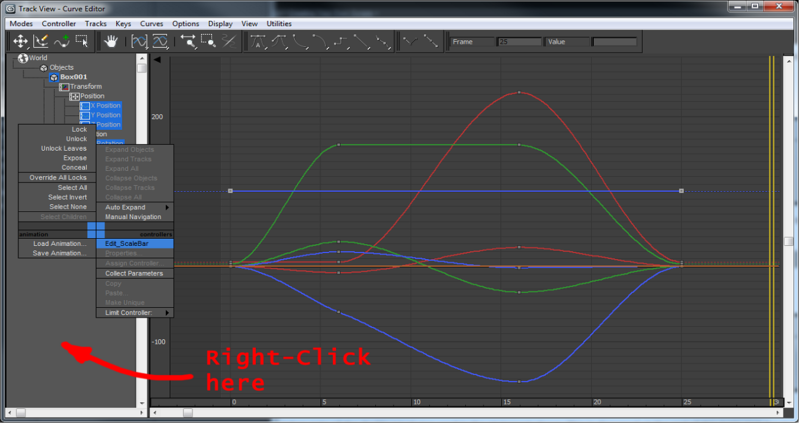 If you Right-click on the side where the keys are, you will deselect the Scale tool, so the script becomes pointless. Refresh your Curve Editor. 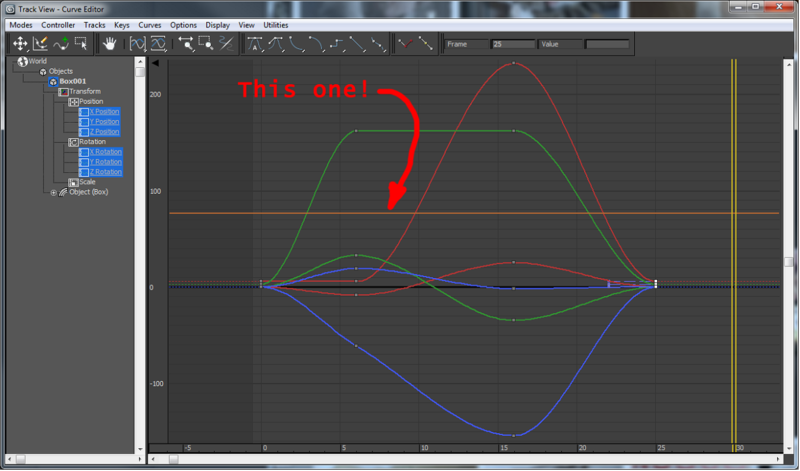 This is a bit annoying but I couldn’t find a way to automatically refresh the Curve Editor window after the script. You can refresh it manually just by using the middle mouse button to pan the window. 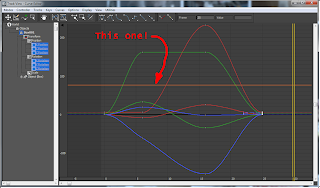 An ALTERNATIVE way is to move the scale bar BEFORE selecting the Scale Values tool. For this you can just Right-click on the side where the keys are, select the script, enter the value and then select the Scale too. The bar will appear at the corresponding value.